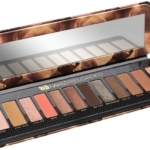 With the super-pigmented formulas that Urban Decay and other makeup companies are making, it makes sense that companion products need to step it up, too. 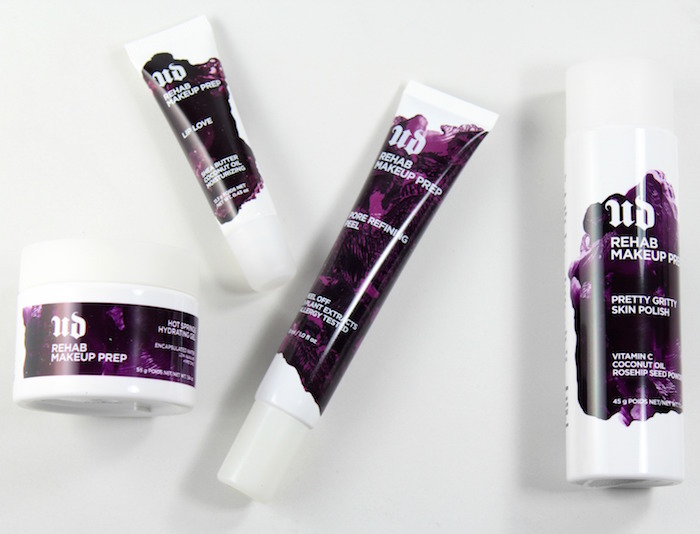 The Rehab makeup prep products are designed to be used to get skin ready for makeup by refining pores, polishing and hydrating skin and moisturizing lips. 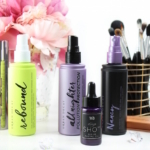 The Meltdown lineup has everything you need for the most effective makeup removal ever! Pretty Gritty Skin Polish: I’m always up for gentle exfoliation and this polishing powder is a nice scrub to brighten skin before makeup. You pour about a dime-sized amount of powder into your hand, add a bit of water to create a foam. The formula contains Vitamin C, coconut oil and rosehip seed powder. I didn’t experience any irritation. I really like this product, and it’s great for travel, too. 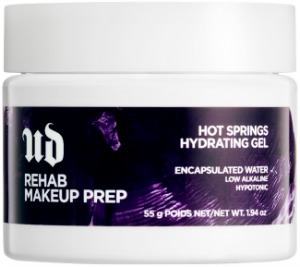 Hot Springs Hydrating Gel: This gel-moisturizer is applied after cleansing and before makeup. 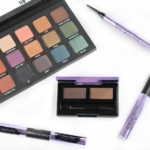 It’s lightweight, has a cooling effect due to encapsulated water in the gel, and hydrating. I really like how quickly it’s absorbed into skin. This moisturizer does have a significant amount of Dimethicone in the formula, meaning it will pair great with a primer that has silicones in it. If you’re sensitive to ‘cones, I would advise either sampling first (test patch) or finding something more compatible with your skin type. Rehab Pore Refining Peel: This peel-off mask is good for all complexion types, but especially good for oily and/or combination skins. It’s supposed to be like a pore strip, without the strip. It’s a clear gel that you apply to your nose area and T-zone, leave on for 10 minutes and remove. It does peel off, but I didn’t see significant results from this treatment, so YMMV. Lip Love: I’m always on the lookout for a great lip balm; especially before I apply a matte lipstick. Lip Love is hydrating and soothing, thanks to a combination of shea butter and coconut oil. I use it day and at night before bed, and love waking up to soft, smooth, moisturized lips. Bonus: it tastes like coconut mint! 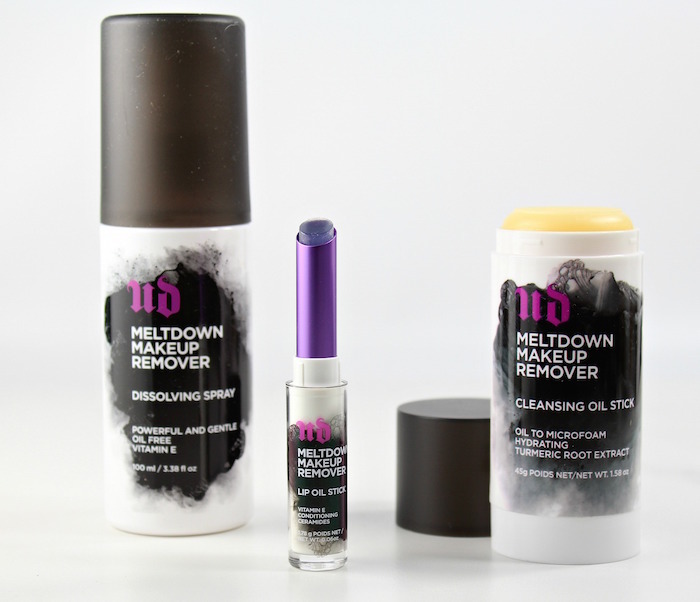 Meltdown Makeup Remover Dissolving Spray: Probably my favorite of all the products in the collection. One spray and makeup is gone. It’s totally gentle and extremely effective at removing even the blackest, most badass mascara. The formula is oil-free, residue-free and contains Vitamin E. If you’re a “two-wipe” person, or you tend to wear a lot of makeup, you need this! Cleansing Oil Stick: I’ll be honest…I’ve never tried a product like this Cleansing Oil Stick before! It works in three stages…you start by swiping the solid balm on your face. Add a touch of water and massage in until the product melts and liquifies. Then lather and rinse off. What I love is the Cleansing Oil Stick, much like a double cleanse, is really effective at makeup removal without leaving your skin feeling stripped. It’s super-convenient for travel, too, as it’s a solid. 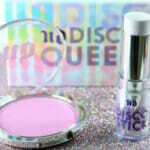 Lip Oil Stick: With today’s lipsticks and glosses being sooooo pigmented, the most effective remover is oil-based. The Meltdown Lip Oil Stick uses a gelled-oil system, meaning it’s a solid (clear) stick that you apply all over lips and wipe off. It leaves lips clean and conditioned. Maybe it’s a habit, but I still like to apply a lip balm after using this. 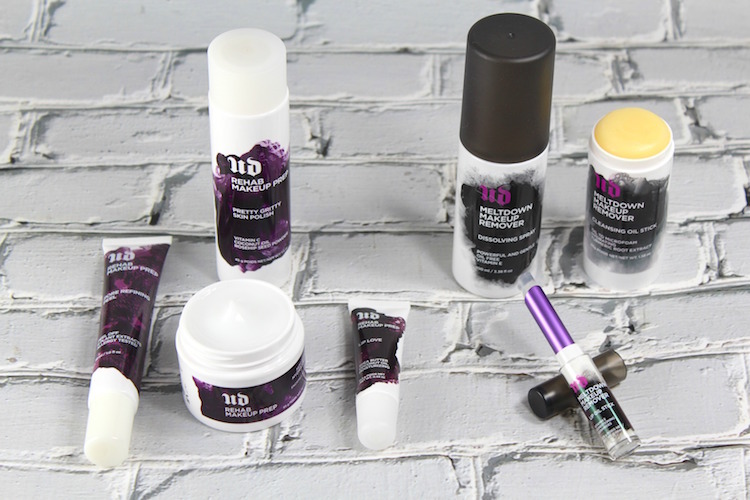 The Urban Decay Rehab Makeup Prep and Meltdown Makeup Remover products are available now at Sephora, Ulta Beauty, select Macy’s stores and urbandecay.com. Do any of these products sound like something you’d use? Let me know in the comments! 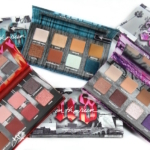 Urban Decay Spring 2017: Prep, Prime and Set!